Autumn is here, and while every recipe seems to be centered around pumpkin, think about how you can include other fall superfoods, such as butternut squash, into your diet. It packs similar fiber content, vitamins, and antioxidants as its pumpkin cousin, but it can be even more versatile in recipes! HealthCentral rounded up some of the best recipes for fall using this amazing superfood. Try serving this delicious vegetable all on its own for a delicious side dish full of heart-healthy fiber. Directions: Preheat oven to 400 degrees. Toss squash with olive oil and garlic in a large bowl. Season with salt and pepper. 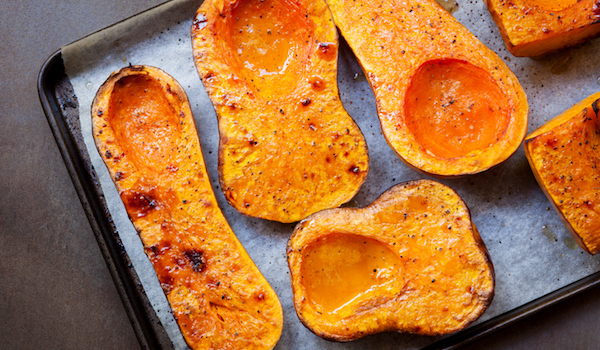 Arrange squash in a single layer on a baking sheet. Roast in the oven for 25-30 minutes (or until squash is tender and lightly browned). 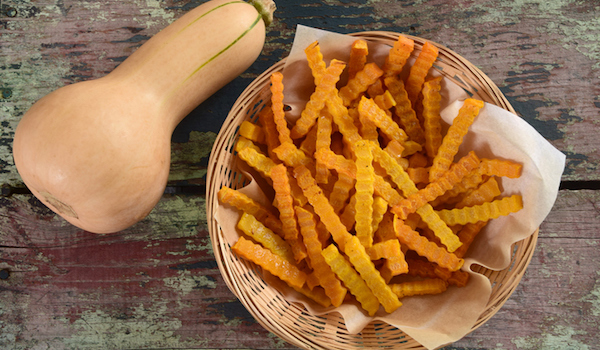 These fries pack more nutrients than traditional potato fries with fewer calories. Think fries are just for kids? Think again. 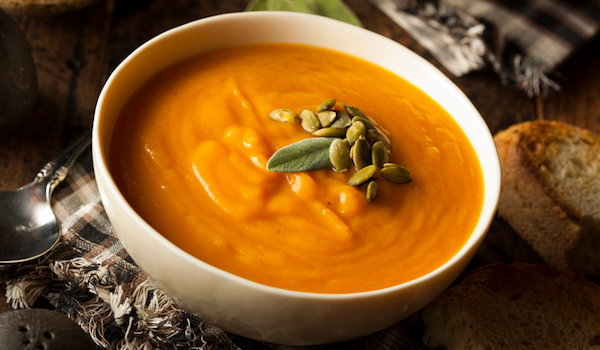 The beta carotene and vitamin A found in butternut squash can help to prevent macular degeneration as you age. Directions: Preheat oven to 425 degrees. Coat a baking sheet with nonstick spray. Place butternut squash sticks in a single layer onto the prepared baking sheet. Add olive oil, oregano, thyme, and cayenne pepper. Season with salt and pepper as desired. Gently toss fries to combine. Place baking sheet into oven and bake for 25-30 minutes, or until golden brown. Top with Parmesan cheese and serve immediately. If you’re stumped on what to make for Thanksgiving dinner this year, consider serving this delicious soup as an appetizer. It’s sure to please everyone at your holiday gathering, since it’s vegan-friendly, gluten-free, and low in calories. The best part: It takes just minutes to prep since it’s cooked in a slow cooker. Directions: Add all above ingredients (except coconut milk) to a large slow cooker. Cook on low for 6-8 hours or on high for 3-4 hours, until squash mashes easily with a fork. Discard sage and stir in coconut milk. Transfer soup into blender and puree until smooth (you will most likely need to puree in two batches). Season with additional salt, pepper, and cayenne paper as needed. Transfer pureed soup back to the slow cooker and serve. 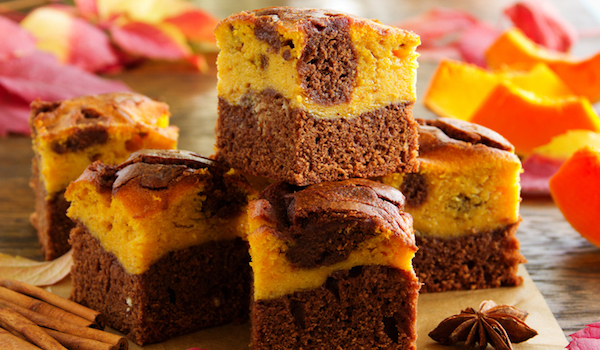 These delicious brownies will please both kids and adults! Using butternut squash in this recipe instead of oil adds a boost of vitamins A, C, E, beta carotene, and zinc, which are essential for a healthy immune system. If you suffer from a chronic inflammatory condition, such as psoriatic arthritis or psoriasis, foods high in these nutrients can help you stick to an anti-inflammatory eating plan. Directions: Preheat the oven to 350 degrees. Grease an 8-inch square baking dish with nonstick cooking spray. Combine the butternut squash, eggs, maple syrup, and vanilla in a bowl and mix well. Sift the flour, salt, cocoa powder, baking powder, and cinnamon together in a separate bowl. Add the flour mix to the butternut squash and mix well. Fold in the chocolate chips. Pour the batter into the greased pan and bake for 25-30 minutes. Place pan on a cooling rack and cool completely before cutting into squares. Cook’s Tip: Butternut squash can be tricky to peel. Try slicing the squash in half and placing it in the microwave for 4-5 minutes prior to slicing — this will soften the peel, making it easier to remove with a knife.